12 Governors intend to block the Medicaid Expansion under the Affordable Health Care Act denying millions medical coverage. In Florida alone this would cause 951,622 people to be without medical insurance by Rick Scott's refusal to allow program. They are sabotaging themselves and Romney which is a good thing! 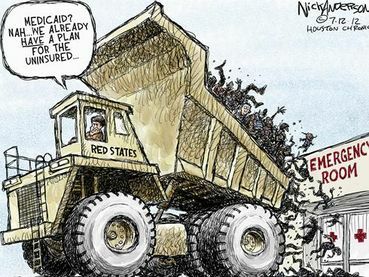 The states rejecting Medicaid are the top rednecks in the USA! They are shameful! Actually there are more registered Democrats in Florida than Republicans but the Democrats got to get off their butts and go to vote. Also there is a lot of dirty tricks played out in this State, I don't think anyone has yet forgot that Gore had this State stolen from him by the Bush brothers. I hear that Charlie Crist will run next time for Governor, he wasn't a bad Governor, he's been the Governor of this State before. He was a Republican but he said he doesn't even recognize the Republican Party anymore, so he is now a Democrat. He was a moderate Republican, he said the Democrats are now more like what the former moderates were in the Republican Party. He would be a far better choice than this nut case tea bagger we have now and there would be a good chance he'd win as many would know of him. Thanks Lynn. Signed and noted. Noted, signed, and forwarded with added postings. Signed and Shared Dandelion. Thank you for this offering My comment on this petition. "There's not enough room here to tell my and my families health care horror stories. I no longer trust the system, period! s&n and added You will only be as strong as your weakest link. Please don't have folks suffering. Chris Christie, get a grip. Signed and noted. The tea party governors will go down with the tea party --we have to see to that! Signed. Our Governor Heineman of Nebraska is opting out. He will not even meet with groups who want to discuss it with him. He said this in July, and he just said it again a few days ago. Thanks Dandelion. Thanks Dandelion for the post, and SuSanne for fiercely forwarding it to all. However, regretfully I cannot sign, not being an American citizen. But I can support you with the whole of my being, since your nation is indeed in a sorry state, rushing fast to the bottom, causing much pain and suffering for so many lives. It is very disturbing. The political and economic elites have lost their minds and hearts and cannot think clearly and consistently. They forbid by law relatively healthy drugs like hemp, while they support by law the sick "drug" of greed. Nothing makes sense anymore. "We live now in an era where normal values have been displaced. The good is called bad, the bad � good." Arizona, Florida, Iowa, Louisiana, Maine, Mississippi, Missouri, Nebraska, Nevada, New Jersey, South Carolina, Wisconsin thus far have opted out. I hope the citizens of each State throw them out on the next election. How dare they allow lives to hang in the balance, how dare they allow their own State's citizens to suffer and go without of all things, MEDICAL CARE! We are not talking about some luxury here, it's medical care. This is a hard hit State for large numbers of the unemployed or underemployed, many low wage workers with no health care and not making enough to buy health care. Spotty income, seasonal, part timers, they all face living daily with no medical care. The Elders who can not afford to buy suppliments to the Medicare are stuck in a similar situation. 20% of what Medicare will not pay for is a lot of money to those who right now do not qualify under Medicaid in Florida that would normally qualify if they lived in other States. One must around $3,000 and below to qualify for Medicaid, IF they meet the other critereas which leaves very few meeting this and able to get the help. A Senior citzen making only $8,000 a year certainly is not living high on the hog, yet, still doesn't qualify, but can't afford to pay anything further. My goodness under that figure no one can even keep a roof over their heads, let alone have a computer to apply for this extra help if they are under $3,000, and yes, a computer or telephone (if they ever answer) is needed as there are no Office people that one can speak to except to go to Tallahassee, miles and miles away for most people. So I thank those who helped, I sent green stars where I could, and really appreciate those who said they forward to others. I agree John, that Universal Health Care is what we really should have, but we do not. In the meantime, people like my daughter suffer, she almost lost her life now twice without medical care. For many of us, this can't wait. We need this Medicaid extention, until we can do better for the citizens of this Country. We go after the fraud, not prevent people from gaining some type of medical attention when they truly need it. This idiot that was voted in for Governor, Rick Scott, made his money off of being part of the biggest health fraud in the USA, yet he'd deny the citizens of his State to do without. The governors must not compromise the health of people because of their poor political beliefs. Thx Sheryl for bringing this on the news network, you know I signed earlier when sending it around. I also had negative feedback complaining about the widespread abuse in some states, another reason for not posting this myself. Of course there are always two sides to a coin, same issue in all countries. The slogan of the "social hammock" has been around for decades over here as well. In that sense I agree with John G. But I do see the need in states such as yours, Fl. with fraudulent govt. signed. I don't trust arizona at all. Jan Brewer has been condoning some very unpleasant and illegal scams using the border patrol as her attack dogs,and then handing it over to the state...lawyers are baffled at how they think they can get away with this. but the people affected were still badly treated for no good reason...I blame the federal government for not cracking down on these abuses and scams. is that hospitals and hmo's submit claims over and over,I know someone who was charged five times by the same urgent car. If there wasn't so much FRAUDULENT BEHAVIOR, maybe it wouldn't be so stigmatized. @ Jytte- if I could sign, you can sign too! This one requires only first and last name + email ! Not everything in America has to make a profit....some things we just didn't do for money. I don't want fraud either, but I'm real tired of going to funerals of people that died simple due to lack of medical care. People that could of lived had they had access to medical care. It is even more sad when those funerals are for the young in their twenties. What kind of a Country allows that when they CLAIM to be so Rich and Righteous? PETITION: Support Medicare and Social Security! "Expand Medicaid to 133% of the federal poverty rate." Thanks for the link Barbara. The hotlink is below that Barbara left. The situation with fraud will only end when people learn good behavior from non-corrupt and non-greedy leaders. We need good and honest examples to learn from; when honesty becomes a habit then people will follow suit. There are currently very low ethical standards worldwide due to the neo-liberal policies and their greedy values, only bad behavior can come from that. When we embrace social cooperation rather than individual competition, there will not be a need for cheating since cooperation implies abundance for all instead of overindulgence for the few. N&S and reminded them that they were voted in and their job is to take care of their constituents, which they are not doing..and that it mus t be nice to have wonderful health care themselves including all of the 'entitlements' they DID NOT EARN, nor deseeve. That health insurance is a for profit business is just disgusting and that people are allowed to die while politicians and billionaires get away without paying taxes is APPALLING and shows just how corrupt this govt is. Thank you Angelika, I wish the citizens of this Country would place half the effort that you do into things that apply to them. Isn't covering emergency room visits for the indigent just a TAD more expensive than Medicaid? Just a TAD? Oh, and Dandelion, best of luck to you in Florida. Noted & signed. TY, Dandelion! Signed, sent & noted. Thank you, Dandelion. Noted, signed, and shared on Facebook. Signed, noted and forwarded. Thanks for sharing.